According to the official IEBlog, Microsoft will soon start its attempt to get users off of legacy versions of the Internet Explorer browser and onto its latest version. "Starting on or about the third week of April, users still running IE6 or IE7 on Windows XP, Windows Vista, Windows Server 2003, or Windows Server 2008 will get will get a notification through Automatic Update about IE8. "This rollout will start with a narrow audience and expand over time to the entire user base. On Windows XP and Server 2003, the update will be High-Priority. On Windows Vista and Server 2008 it will be Important." "IE8 will not automatically install on machines. 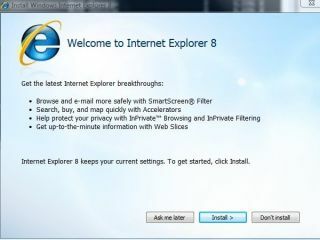 Users must opt-in to install IE8. Users will see a Welcome screen that offers choices: Ask later, install now, or don't install," adds the post.